Reid was frustrated in 2012 but shared his feelings with manager Brian Cody and Henry Shefflin. TJ REID HAS revealed that he almost quit hurling for Kilkenny three years ago. 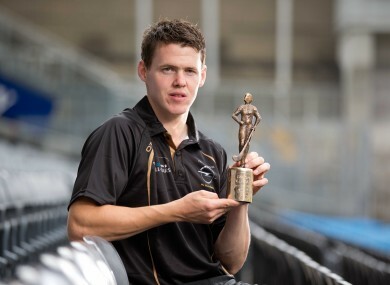 The raging hot favourite to be crowned Hurler of the Year was left disillusioned when he was dropped for the 2012 All-Ireland quarter-final against Limerick, having been whipped off by manager Brian Cody in the Leinster final defeat to Galway. It was a difficult couple of seasons for the Ballyhale Shamrocks colossus as he was also taken off in the 2011 provincial final and All-Ireland semi-final, before losing his place for the All-Ireland decider against Tipperary. But that quarter-final against Limerick three years ago marked a turning point for Reid. He sucked it up, came off the bench to play extremely well and, was involved in five Kilkenny points. Since then, he’s never looked back and his form over the past two seasons has been brilliant as Kilkenny claimed back-to-back Liam MacCarthy Cup wins. Reid, 27, is now firmly established as Kilkenny’s attacking fulcrum but as a young player attempting to nail down a regular place in the team, competition was fierce. “I came into the set-up as a young man,” said Reid, who was honoured yesterday with the September GAA/GPA Opel Player of the Month award. “The Kilkenny team was evolving Brian Cody was evolving as well in terms of having a ruthless streak in him. “I was competing against lads at the peak of their powers – Henry Shefflin, Martin Comerford, Eddie Brennan, Richie Power was there before me, Eoin Larkin was there before me, Derek Lyng and so on. In his new book, Shefflin alluded to Reid’s situation and revealed that his Ballyhale clubmate was indeed close to walking away. And Reid confirmed: “Yeah, I don’t like talking about it, I suppose that’s the past. “But I was frustrated I suppose, I was been taken off and getting dropped here and there. “As a player, as a young hurler, you just want to be hurling. I was getting annoyed about it. I suppose for that game against Limerick I was dropped and I was annoyed over it. “I was thinking about retiring. I would be very good friends with Henry. “He sat me down and spoke to me. So it was my choice then. “I suppose what turned it was that I loved it so much and it would have been hard to walk away from it. “I think it was a stepping stone for myself. I spoke to Brian about it as well. Cody may be perceived as a clinical operator but Reid insists that he could discuss his plight with the manager. “Yeah, I suppose some players are maybe afraid to open up to Brian about how you feel about the set-up. “I opened up and I think after that I’m after becoming a different player,” he revealed. Naturally, Reid is pleased with the form that has left him as a virtual shoo-in for the Hurler of the Year accolade. “Definitely, over the last few years I think it’s been very good,” he acknowledged. “Myself, I’m after concentrating on nutrition and conditioning. “At the start of the year I had three goals – if I can get my nutrition 100 per cent, my conditioning 100 per cent and my fitness 100 per cent, then everything else should look after itself. “When you are going out to the field knowing you have everything done right you should have no worries about on the field then. Reid also insisted that Cody will be in charge for an 18th season in 2016, having annexed an eleventh All-Ireland senior title as Noreside supremo last month. “He’s definitely staying on I’d say… more than likely. “He’s retired from his principal duties so he’s 100 per cent on hurling every day now. Email “Hurler of the Year in waiting TJ Reid almost quit playing for Kilkenny a few years ago”. Feedback on “Hurler of the Year in waiting TJ Reid almost quit playing for Kilkenny a few years ago”.